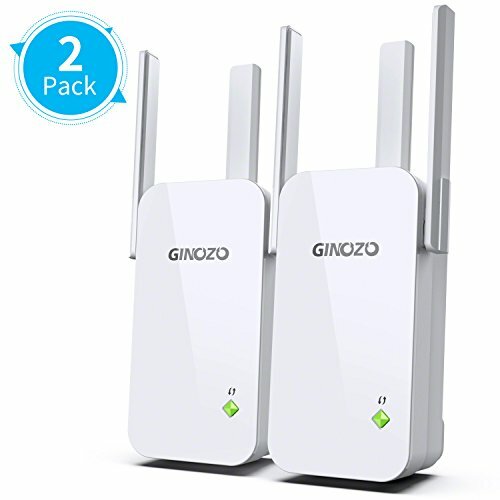 Ginozo WiFi extender aims to expand your original WiFi coverage to further place, enhance WiFi signal to be stabler on weak areas, fully cover the house with strong signal, provide you a continuously and smooth network environment. With powerful universal compatibility, works with any standard Wi-Fi router, this means you don’t need to worry about giving up the router that you’ve come to love. Ginozo WiFi repeater updated the 3 spiral external antennas to ensure WiFi signal runs stable and reliable enough, no more erratic connection. Enjoying carefree surfing the Internet. Smooth Fluent videos, high speed loading pictures was easily implemented everyplace on the house. Connect to SSID network, use PC/Laptop/Phone to set up the device, NO NEED to Connect Ethernet Cables, follow the user guide steps by steps, no high technology skills required, 95% customers can easily finish the setting in 3 minutes following the user guide, elders and teenagers could also set up well independently. 【Money-back Guarantee】Still have a question setting up the range extender? Ask our technical specialists 24/7 online. 1-Month money-back guarantee and 12 mouths warranty, brings you worry-free after-sales service experience.